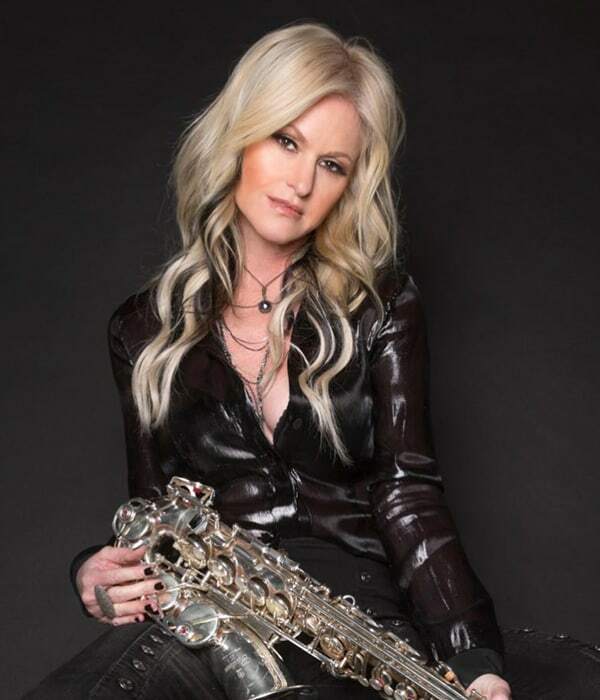 One of the most recognized and sought-after saxophonists, two-time GRAMMY nominee Mindi Abair has been electrifying audiences with her dynamic live performances and sax prowess since her debut album in 2000. No one since Junior Walker has brought saxophone and vocals in one package to the forefront of modern music, with a raucous tone and abandon. She has garnered ten #1 radio hits, six Top 5 solo records and two #1 spots on the Billboard Contemporary Jazz album chart. In 2014, Mindi received her first GRAMMY® nomination in the Best Pop Instrumental Album category, followed by a 2015 GRAMMY® nomination for Best Contemporary Instrumental Album for her solo LP Wild Heart featuring the late Gregg Allman, Joe Perry, Trombone Shorty, Booker T. Jones, Keb Mo, and Max Weinberg. The daughter and granddaughter of working musicians, Abair continues to captivate fans while evolving her sound. In 2014, after two seasons as the featured saxophonist on the hit series American Idol, Abair released Wild Heart. This LP showcased a compilation of grittier rock and soul tracks featuring some of the biggest names in music. To help translate this sound to her live shows, Mindi enlisted longtime friend and The Boneshakers founder Randy Jacobs (Bonnie Raitt, Was Not Was, Willie Nelson) to inject his brand of Detroit Rock/Funk. The collaboration was undeniable, and it lead to an almost immediate decision to join forces creatively. Mindi Abair and The Boneshakers features Mindi (Saxophone, Vocals), Randy Jacobs (Guitar, Vocals), Sweet Pea Atkinson (Vocals), Rodney Lee (Keys), Derek Frank (Bass, Vocals), and Third Richardson (Drums, Vocals). Their first record together Mindi Abair and The Boneshakers LIVE in Seattle was released September 2015, and recorded at their first official show together in Seattle February 2015. Almost two years later, the band is preparing for their first studio release. The EastWest Sessions was recorded over five days at legendary Hollywood recording studio EastWest Studios with renowned rock/blues producer Kevin Shirley (Led Zepplin, Joe Bonamassa, The Black Crowes, Aerosmith). The album, which will be released September 15, 2017, features a track with iconic blues guitarist Joe Bonamassa and 2017 GRAMMY® winner in the Best Contemporary Blues Album category, Fantastic Negrito. When shes not touring as Mindi Abair and The Boneshakers, the Berklee graduate can often be found recording and touring with a wide array of legendary peers: Joe Perry, Trombone Shorty, Booker T. Jones, Aerosmith, Bobby Rush, Keb Mo, Adam Sandler, Duran Duran, Lalah Hathaway and the Backstreet Boys.